50 Years On, U.S. Presidents Still Seek Elusive Peace To A 6-Day War : Parallels With Arab armies massed on its frontiers, Israel unleashed a lightning strike on June 5, 1967. Donald Trump is now the 10th president seeking a lasting solution to that brief war. 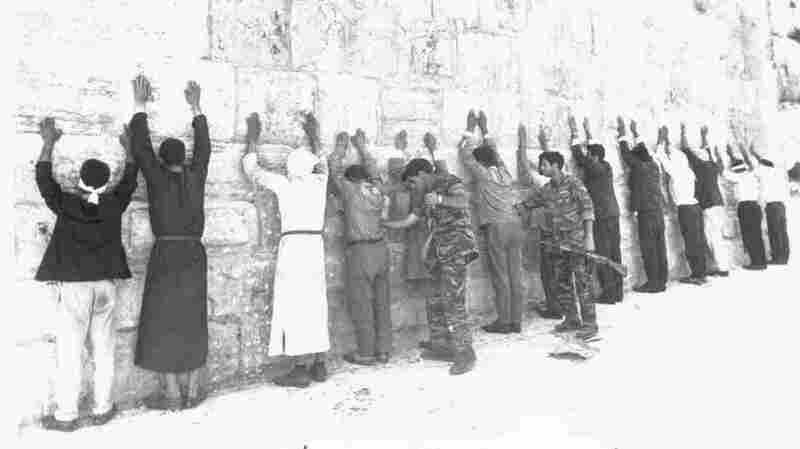 Israeli soldiers search Arab prisoners as Israeli forces take over the Old City in East Jerusalem on June 8, 1967, during the Arab-Israeli Six-Day War. Just 11 days after the war ended, U.S. President Lyndon Johnson offered the first of many peace proposals by U.S. presidents over the past half-century. "Our country is committed to a peace that is based on five principles," Johnson told a hall packed with American diplomats. His principles were broad. They included "justice for the refugees," "limits on the wasteful and destructive arms race" and "political independence and territorial integrity for all." Johnson's proposals didn't go very far, but he established the tradition of U.S. presidents attempting to broker a lasting peace to a seismic war that has shaped the Middle East to this day. With Arab armies massed on its frontiers, Israel unleashed a lightning strike on June 5, 1967, defeating the combined forces of Egypt, Jordan and Syria, and tripling the amount of land under Israeli control. Israel drove Egyptian forces out of the Sinai Peninsula and the Gaza Strip, where Egypt had authority over Gaza's Palestinian population. The Jordanians were pushed out of east Jerusalem and the rest of the West Bank, areas where the population was also Palestinian. And the Syrians were forced from the Golan Heights. In less than a week, the Mideast suddenly looked very different. Israel, which had feared for its existence, instantly became the region's leading military power. The grandiose promises by Arab leaders, who pledged to destroy Israel, rang hollow. And the region was locked in a state of confrontation that remains unresolved. Over the past half-century, Israel has made peace with Egypt and Jordan. But the Israeli feud with the Palestinians in Gaza and the West Bank grinds on, and Israel still holds the Golan Heights it took from Syria. Shortly before he visited the Mideast last month, President Trump said he thought he could make peace between Israelis and Palestinians — "something that I think is, frankly, maybe not as difficult as people have thought over the years," Trump said. The Arabs and the Israelis fought another war in 1973, though it ended with no significant changes to the battle lines. The following year, Richard Nixon became the first sitting president to visit Israel. "The road ahead is difficult," Nixon said as he touched down at Israel's Ben-Gurion Airport near Tel Aviv. 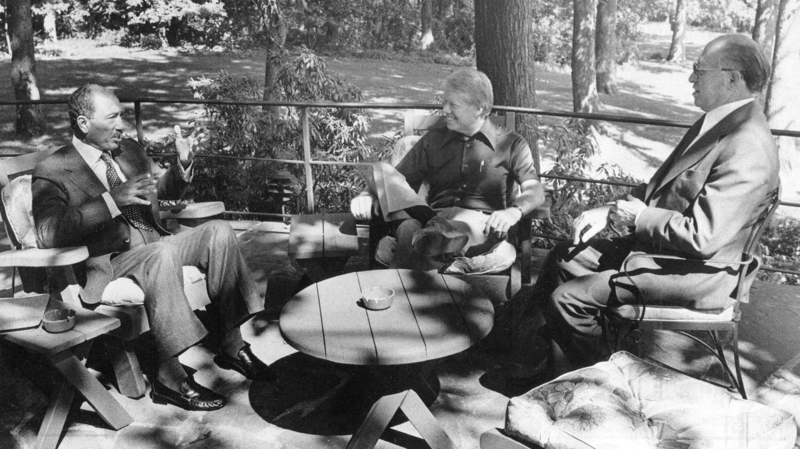 President Jimmy Carter hosts Egyptian President Anwar Sadat (left) and Israeli Prime Minister Menachem Begin (right) at Camp David, Md., in 1978. They reached a historic peace deal, the first ever between Israel and one of its Arab neighbors. He was talking about Mideast peace. But his remarks also applied to his troubled presidency: Just two months later, he resigned due to the Watergate scandal. The first big breakthrough in U.S. peace efforts came in 1978, when President Jimmy Carter brokered a peace deal between Israel and Egypt at the presidential retreat in Camp David, Md. "When we first arrived at Camp David, the first thing upon which we agreed was to ask the people of the world to pray that our negotiations would be successful. Those prayers have been answered," Carter said in announcing the deal. Peace between Israel and Egypt still holds, though it's often described as a "cold peace." Israel and Jordan came to terms in 1994. Since then, hopes for peace on other fronts have been repeatedly dashed. Some presidents, like Ronald Reagan, openly opposed a Palestinian state as a way to settle the conflict. President Clinton presides over the 1993 interim peace accord between Israel and the Palestinians on the White House lawn with Israeli Prime Minister Yitzhak Rabin (left) and Palestinian leader Yasser Arafat (right). Years of negotiations followed, but the two sides couldn't reach a deal. Afterward, Clinton was highly critical of Arafat, telling him, "I am a failure — and you made me one." "It is clear to me that peace cannot be achieved by the formation of an independent Palestinian state," Reagan said in 1982. He called for Palestinian autonomy, but not full statehood, in the West Bank and the Gaza Strip. Another decade would pass — and many lives would be lost — before there was a major advance. 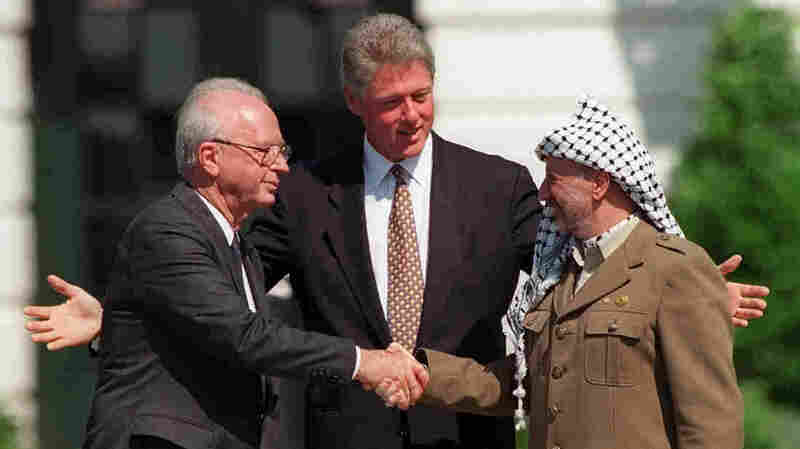 President Bill Clinton hosted Israeli leader Yitzhak Rabin and Palestinian leader Yasser Arafat on the White House lawn for the signing of an interim peace agreement in 1993. They gave themselves five years to work out a deal. But the rocky, start-and-stop negotiations spanned Clinton's entire presidency. The Israelis and the Palestinians came close in the summer of 2000, when Clinton convened the parties for two weeks of talks at Camp David. But they couldn't bridge the gaps, and a Palestinian uprising, or intifada, erupted in September 2000. Clinton was still trying to reach a deal in his final days in office, in January 2001. But Arafat, notorious for his vague, maybe-yes, maybe-no answers, ultimately rejected Clinton's final proposal. "In one of our last conversations, Arafat thanked me for my efforts and told me what a great man I was. 'Mr. Chairman,' I replied, 'I am not a great man. I am a failure. And you have made me one,'" Clinton wrote in his autobiography, My Life. But Clinton did entrench the U.S. as the main broker. A future Palestinian state became a given. And Arafat became a scapegoat. President George W. Bush encapsulated all this in 2002, a time of ferocious Israeli-Palestinian fighting. "My vision is two states, living side by side, in peace and security," Bush said. But his vision did not include Arafat. "I call on the Palestinian people to elect new leaders. Leaders not compromised by terror," he said. Arafat died two years later, but negotiations didn't get easier. The radical group Hamas grew stronger, winning Palestinian elections and taking control of Gaza. Israel kept expanding Jewish settlements and deepened its military occupation over Palestinians in the West Bank. President Barack Obama often criticized Israeli settlements and scolded both sides during a speech last September at the United Nations. "Israelis and Palestinians will be better off if Palestinians reject incitement and recognize the legitimacy of Israel but Israel recognizes that it cannot permanently occupy and settle Palestinian land," he said. Which brings us back to Trump. After his confident prediction before his Mideast trip, he struck a more cautious note when he was in Jerusalem last month. "It's not easy. I've heard it's one of the toughest deals of all. But I have a feeling that we're going to get there eventually. I hope," he said while standing next to Israeli Prime Minister Benjamin Netanyahu. Trump is now the 10th president, over 50 years, seeking a solution to the Six-Day War. Greg Myre was based in Jerusalem from 1999-2007 and is the co-author of This Burning Land, on the Israeli-Palestinian conflict. Follow him @gregmyre1.